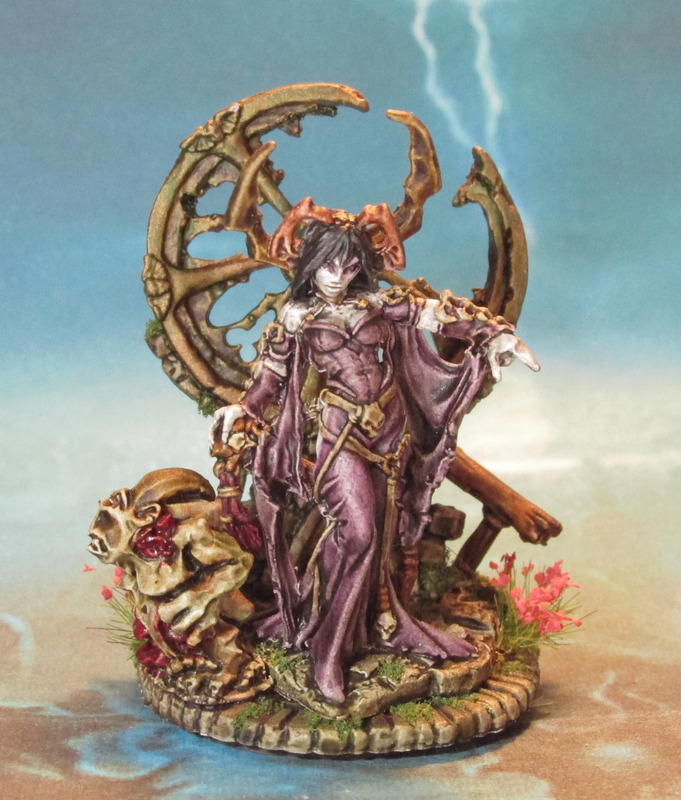 I, like many a miniature gamer, spend a lot of time painting, and for entertainment enjoy nothing more than to watch (or at least listen) to YouTube whilst I’m doing so. 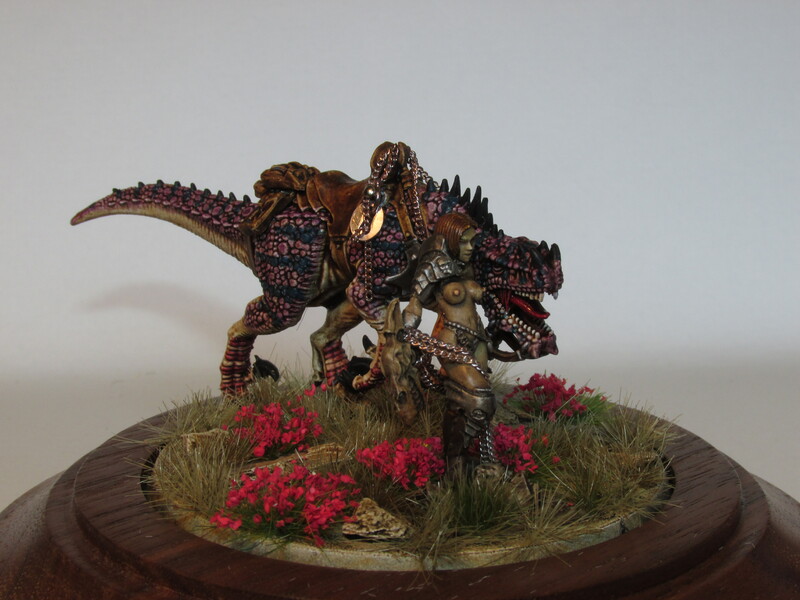 Now there are a lot of entertaining folks out there in the YouTube community sharing their hobby and one such man is the legend that is Mr. Reef Beastman. 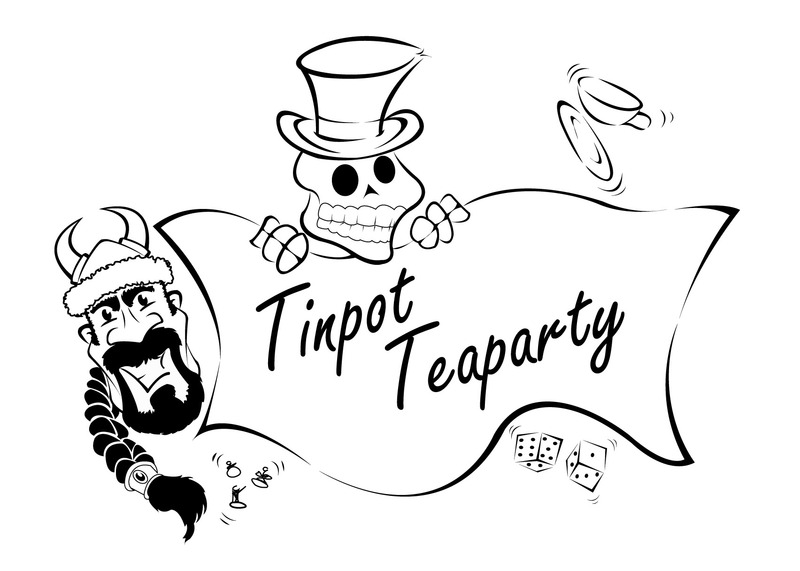 For many years Reefy produced a monthly show about his war gaming exploits, usually tallying in at 3 to 4 hours at a time and although he is now in semi-retirement and produces shows less frequently, I still enjoy watching them whenever he posts something new (or just re-watch some of the old ones which he has saved to his new channel). 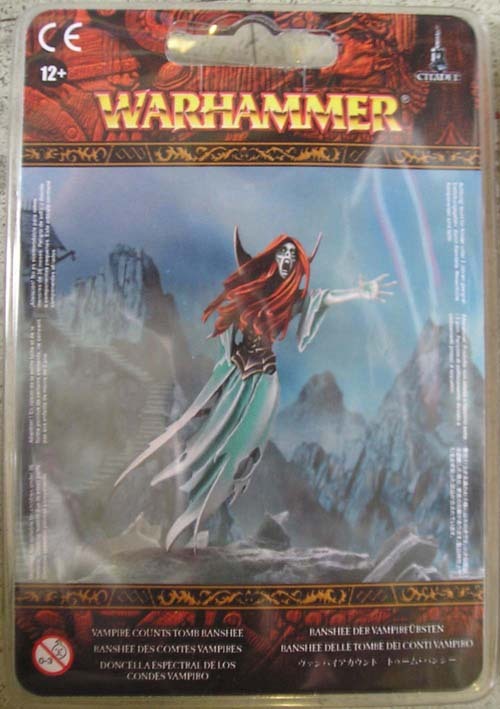 I have made comments on videos and chatted with Reef in the past and one such interaction led to us arranging to meet up for a game at Warhammer World. 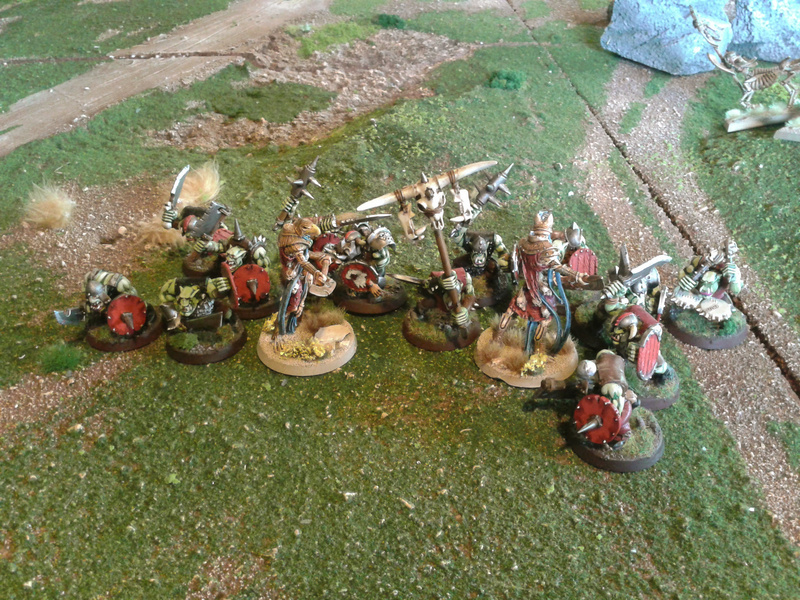 I pulled together a small selection from my Grande Armée de la Mort, to field a detachment which will hither to be known as the ‘Children of the Hydra’ and headed off for my first ever game of Age of Sigmar. 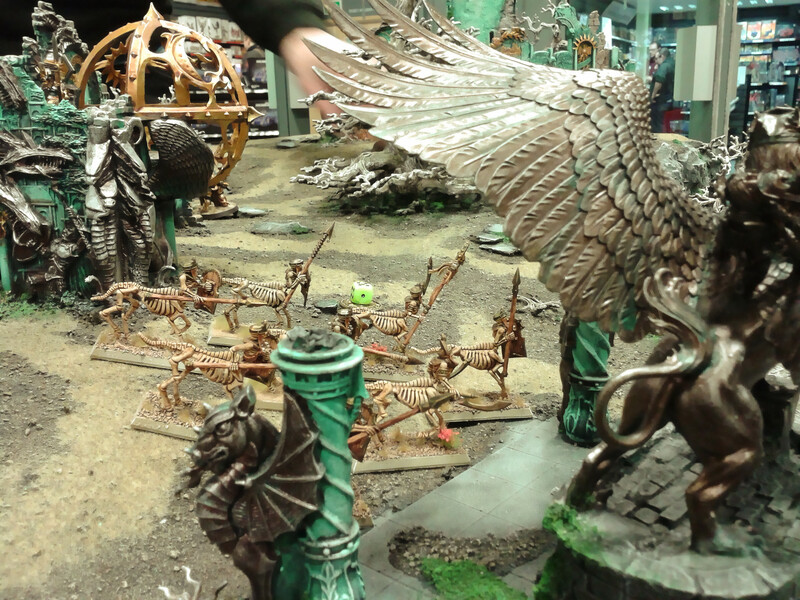 The tables at Warhammer World are breathtaking and the one Reef had booked for our game, a dedicated AoS board, was definitely no exception. 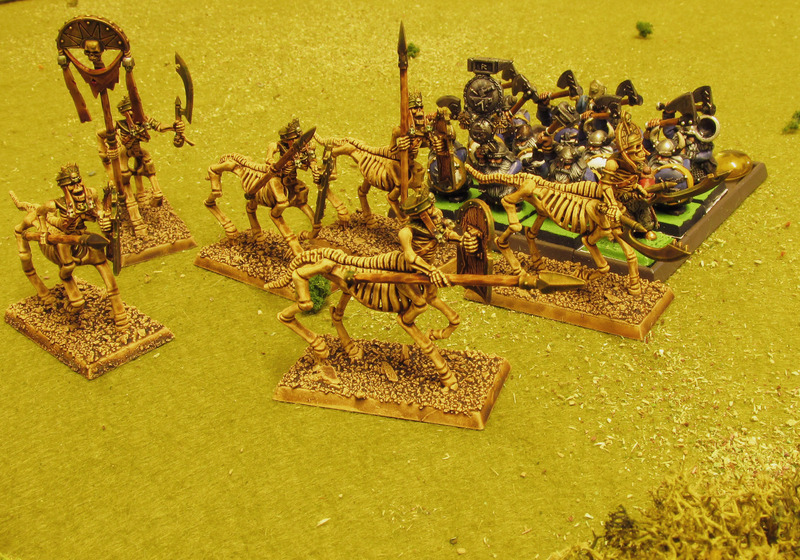 Tomb Kings cavalry march forward under the unseeing gaze of decrepit statuary. 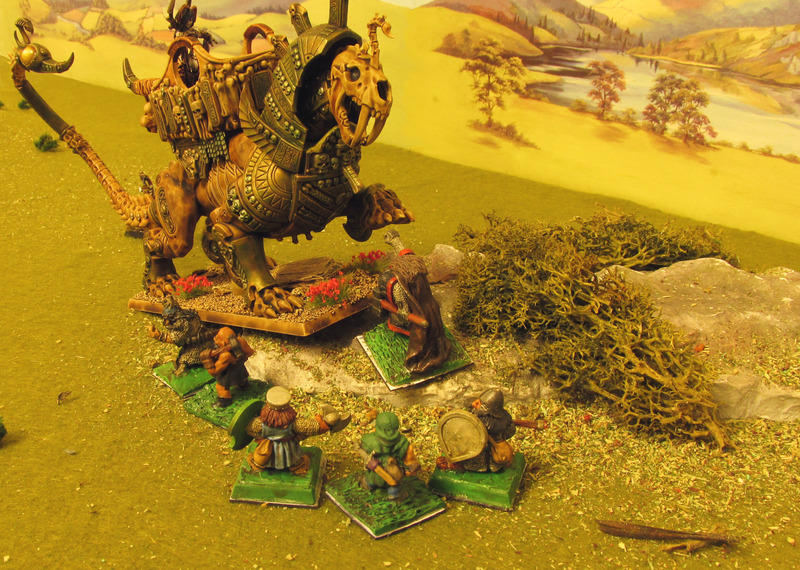 Sigmarite Prosecutors swoop in to save their beloved Griffhound. 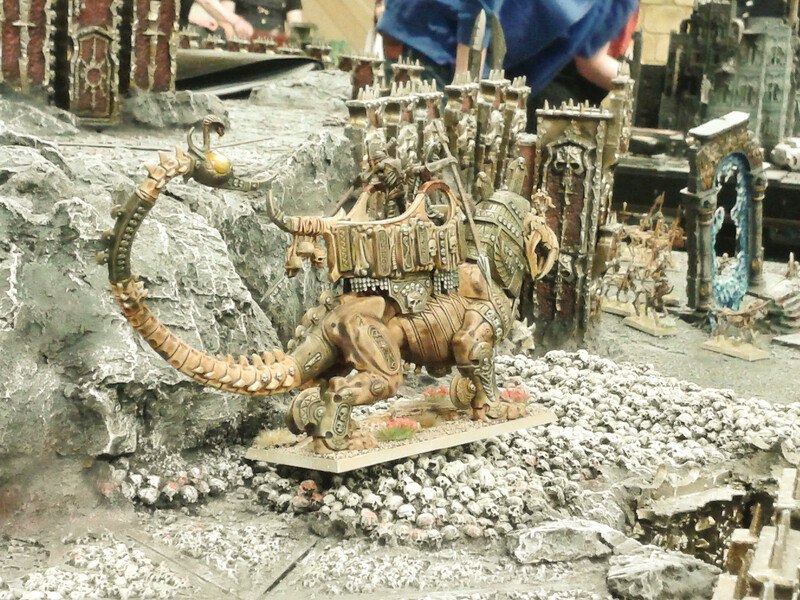 The monstrous War Sphinx stomps forward. I had such a good time that we agreed to meet up the next day to see if Reefy could salvage some honour. This game was not only to take place on another table but was to also include a third member, Mr. Remington Steele (another You tuber of much renown), who would be arriving later on in the battle to side with whoever seemed the most beleaguered. 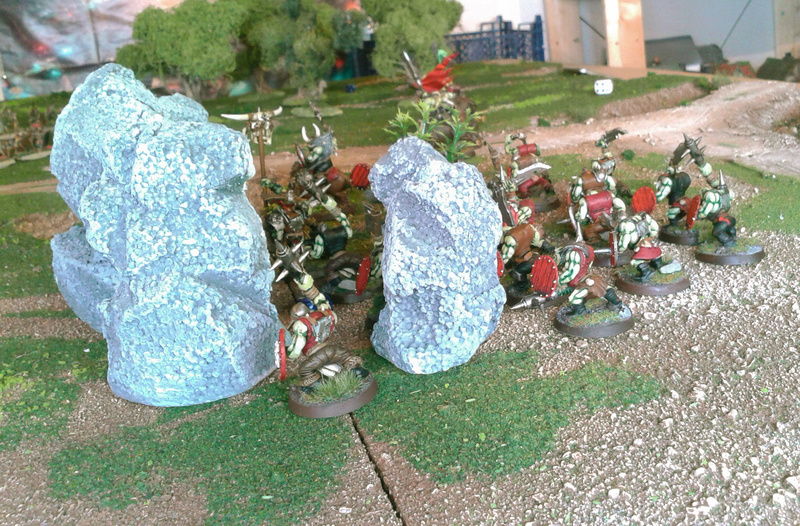 The scenario this time had ‘The Children of the Hydra’ besieging the Sigarites in their Dreadhold fortress. 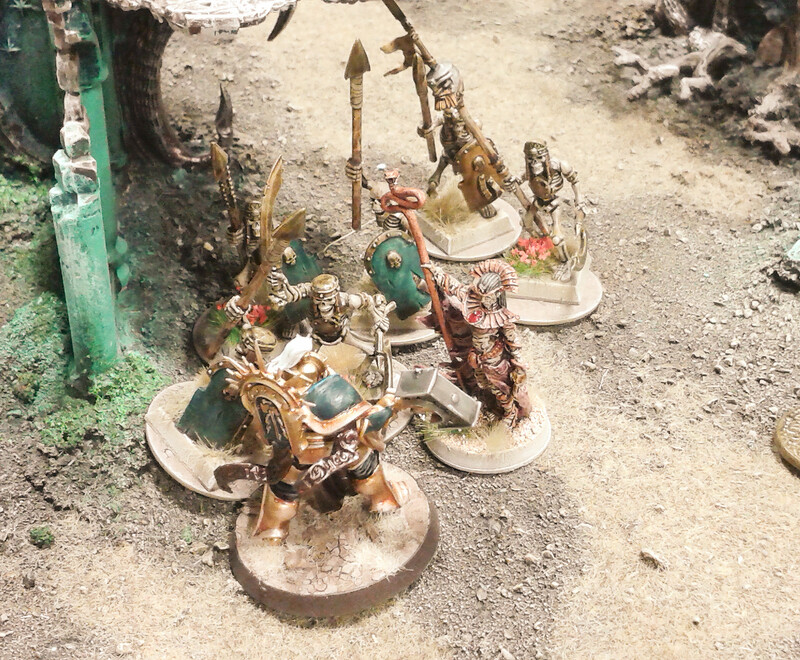 When Remington arrived he was recruited by Reef and deployed his Vampire Counts forces in my rear echelons, caught between the two I battled valiantly until we ran out of time. As these rules have no point system, they are definitely not designed with the competitive war gamer in mind and that suits me just fine, I never liked having to play quartermaster before the battle and work out points down to the last dagger, making sure everything was equal. 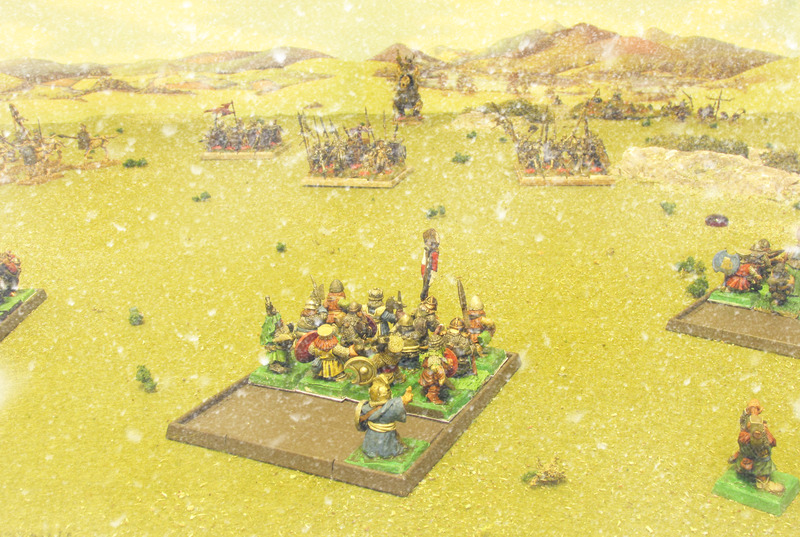 Unequal battles can be very entertaining and fun, you just need to re-define the victory conditions via some kind of scenario. 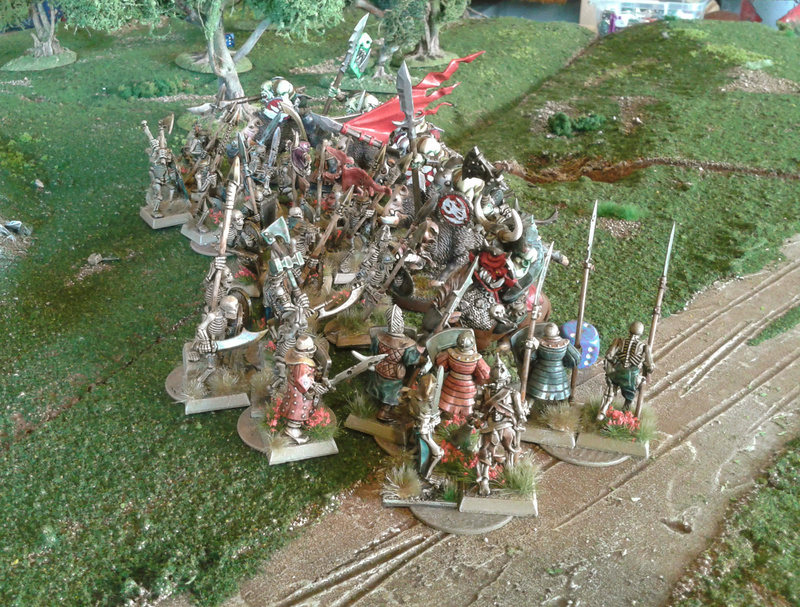 In the example of the 300 Spartans, they were hugely out-numbered, used terrain to best advantage but ultimately died to a man! Does this mean the battle of Thermopylae counts as a win for the Persians? Not necessarily as the Spartans were there to buy time for the Greeks to muster a force capable of facing the Persian threat, they achieved that even at the cost of their own lives. 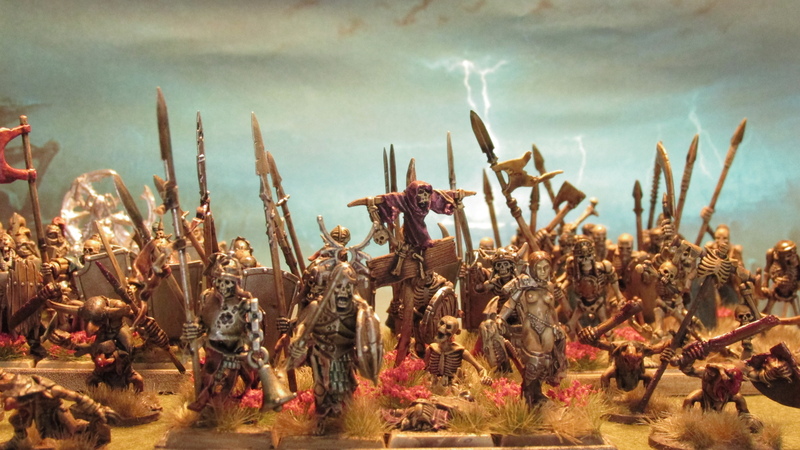 One of the interesting ideas with AoS is that when deploying your forces, alternating the placement of units, at any time one player can choose to stop deploying any more troops. If this happens the other player can, if they wish, keep on placing units. 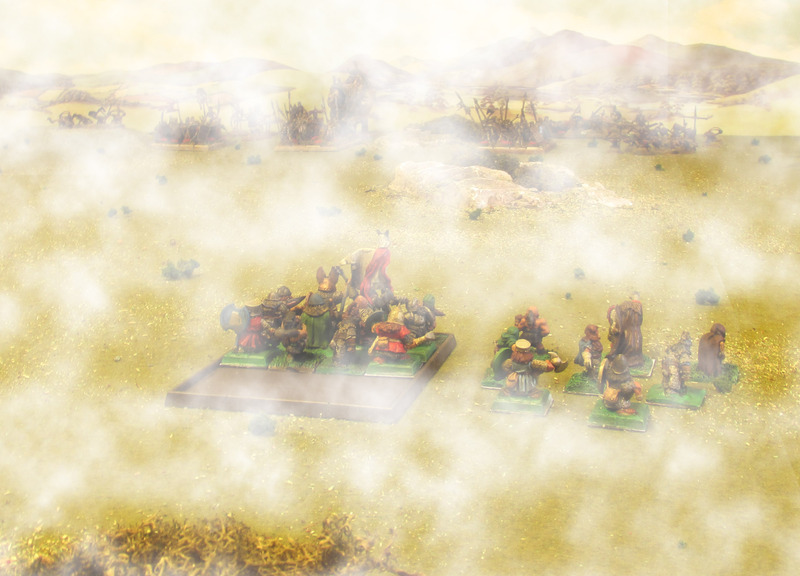 When one side is out-numbered by a certain amount they can choose one of a selection of ‘sudden death’ victory conditions such as – ‘Assassinate the enemy general’ Achieving this mission (even at the cost of your whole army) will win you the game immediately. Now tell me that’s not the perfect plot for an epic fantasy story! 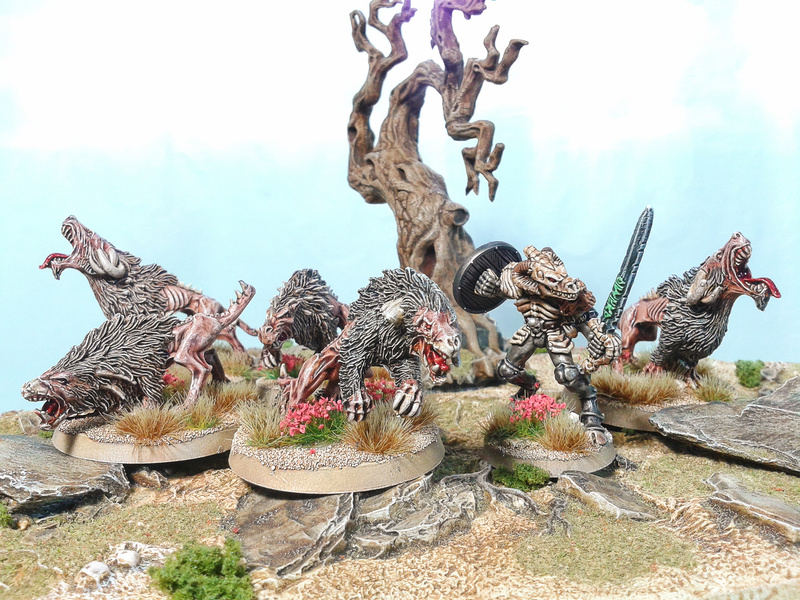 Also the small set of core rules is somewhat deceptive as every single unit, monster and hero has a war-scroll for it, these provide extra rules and stats specific to them. The war-scrolls for the game we played added another 6 pages of rules for me to use! 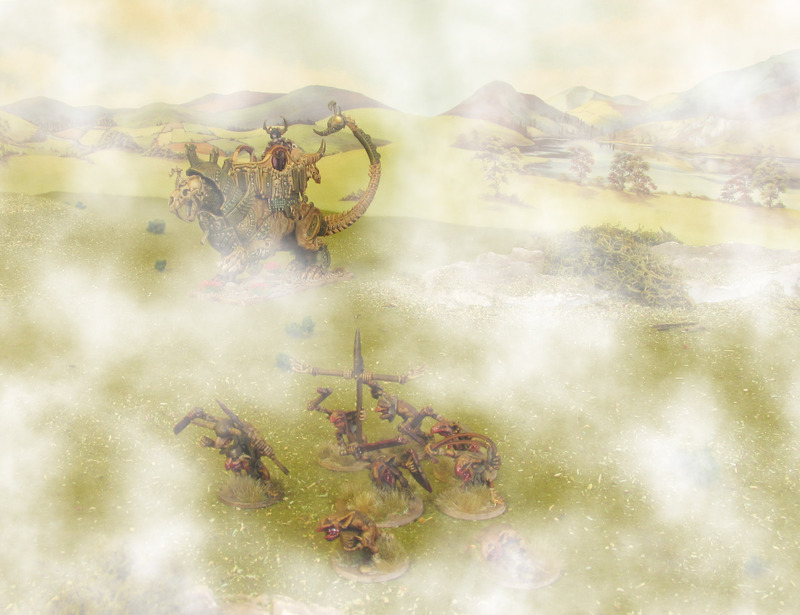 The rules and war-scrolls for all the armies are free to download from the Games Workshop website for you to peruse so I wont go in to all the details, but if you are looking for a simple, fun, scenario-driven fantasy war game it is definitely worth a try. 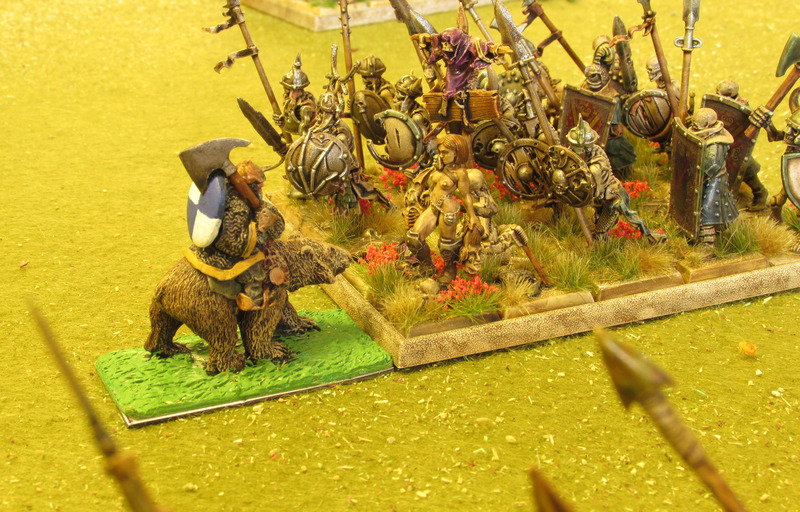 My only gripe is to do with shooting, any unit can shoot both into and out of close combat, now this is somewhat of a double-edged sword and I will try to elucidate as to what I mean by this. 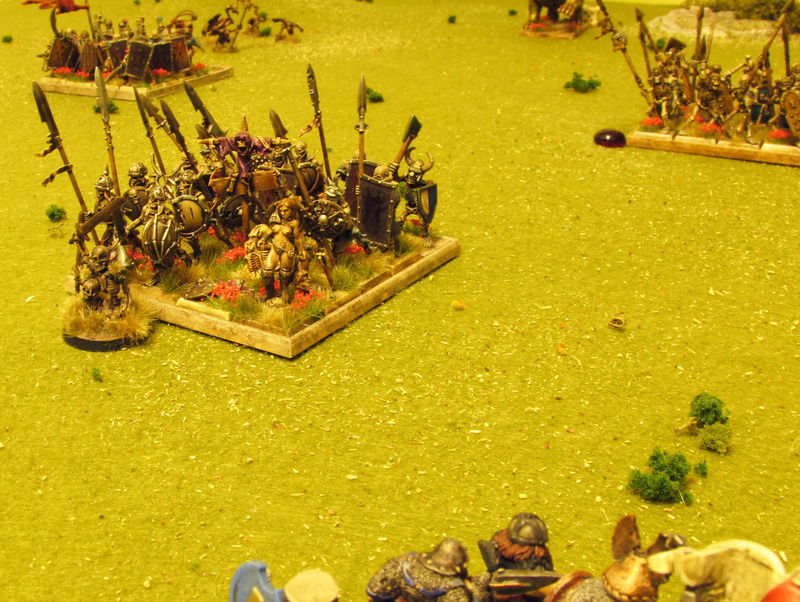 During my own turn, when my skeleton archers were engaged in close combat with an enemy, they were able to either shoot their bows at point-blank range in to the unit with which they were engaged, or ignore them entirely and shoot at any other unit that they had range and line of sight to. This seems a little incongruous to me as I would have thought that they might have been a bit too busy defending themselves from the enemy to knock, draw and loose arrows. I have always liked this rule a lot, there are no lives or nations at stake in the hobby of war gaming only friendships. Is it really worth getting annoyed about something not going in your favour? Better to come up with house rules for anything you don’t agree with later and implement them in the next game. 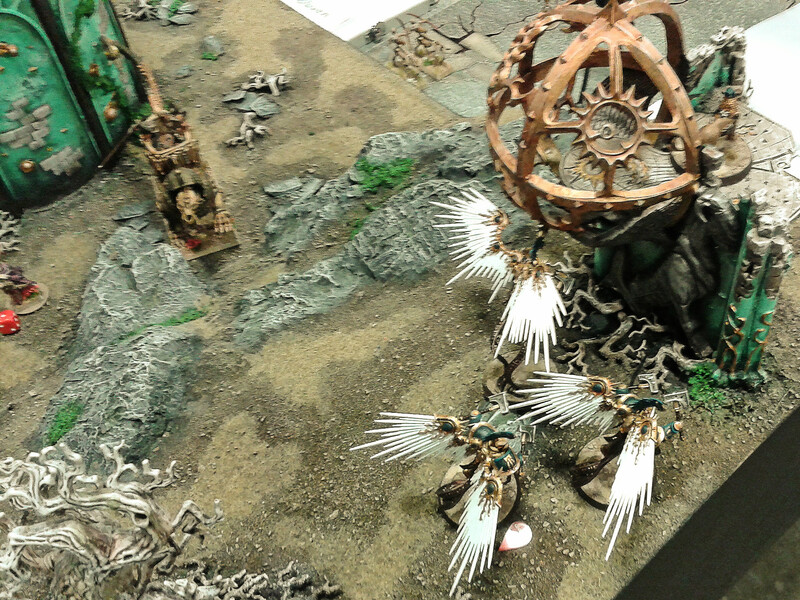 All in all I had a great time playing Age of Sigmar and would definitely raise up my undead horde for another game. 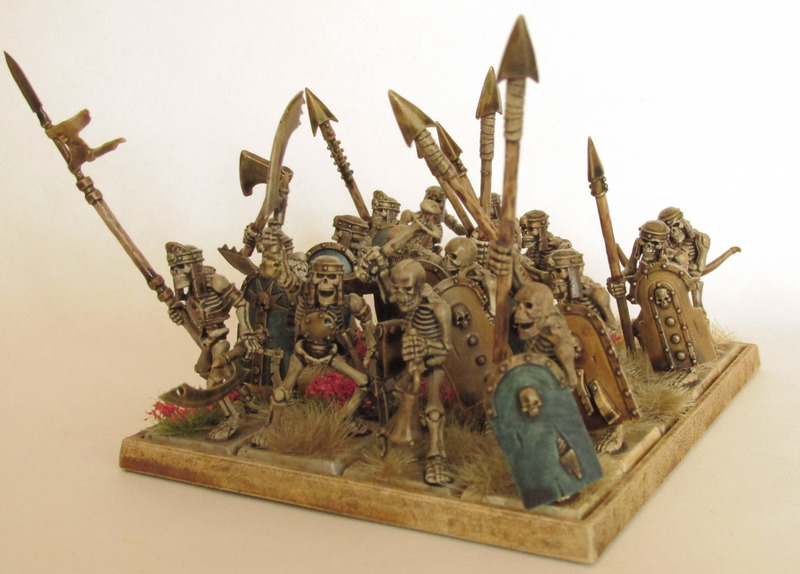 I have acquired some new miniatures for my Grande Armée de la Mort, and having plenty of time on my hands I have managed to paint them up. 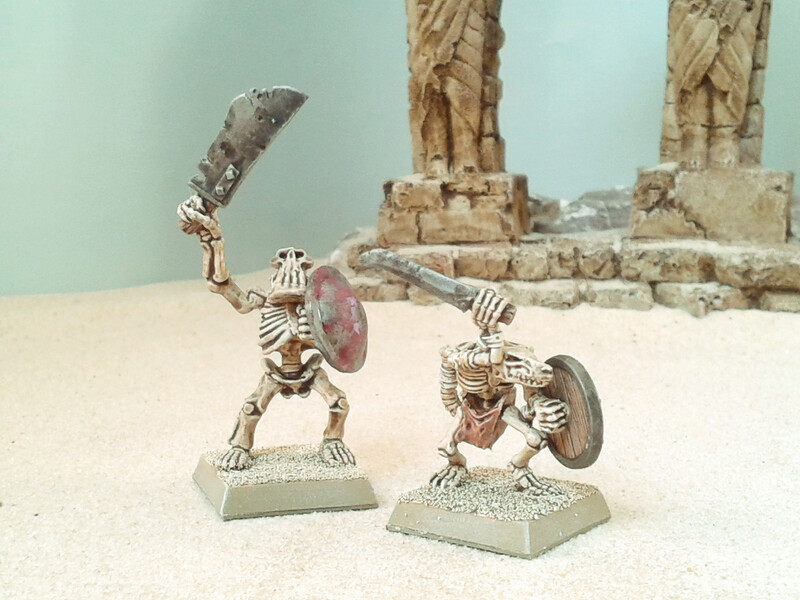 These minis were made by Rackham Miniatures and are beautifully sculpted with lots of elaborate details. 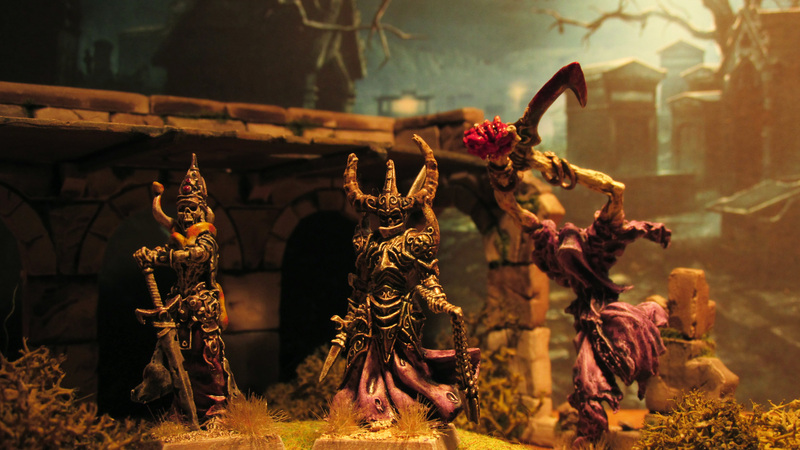 The Wraith floats through the shadows, brandishing a wicked blade with which to reap the wretched souls of the living, whilst the ancient armoured skeleton warriors provide a cadre of experienced generals to lead the undead legions of the Ghoul Queen. 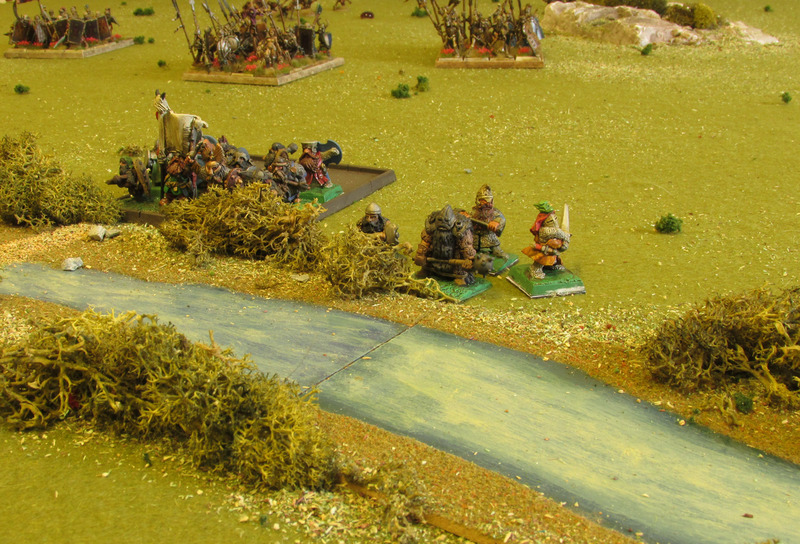 However, they are unable to out-pace the fleet cavalry and decide that it would be better to die facing the enemy. 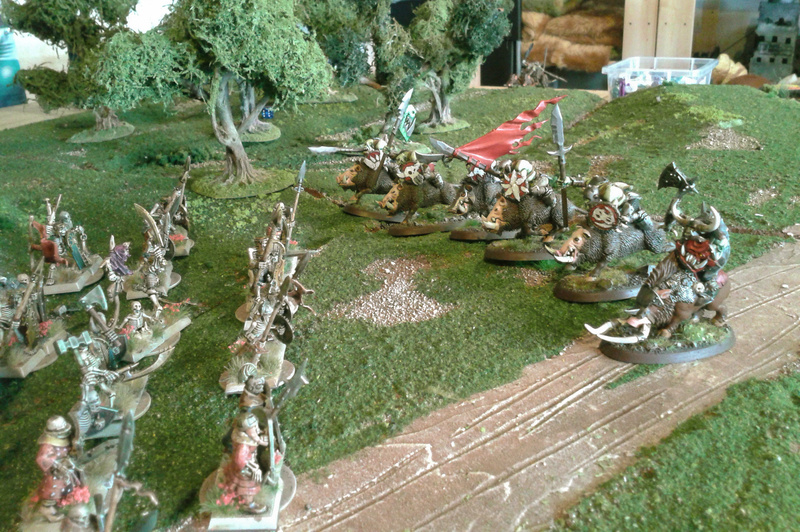 With renewed courage they charge into the flank of the horsemen, smashing them to flinders!.. 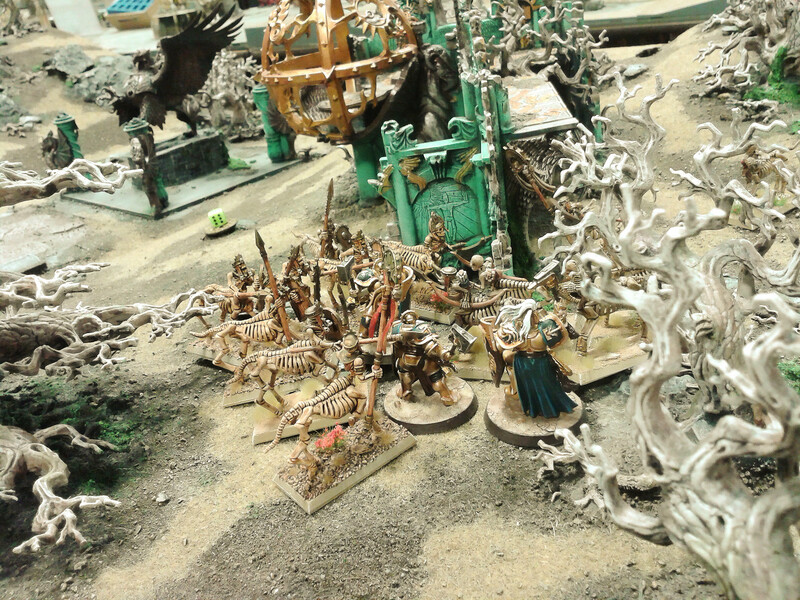 With the fell Necromancer and her Champion vanquished the Dwarves make a desperate last stand at the water’s edge, hoping to stay alive long enough to watch the remaining undead crumble to ash once the last vestiges of the magic animating them bleeds away. 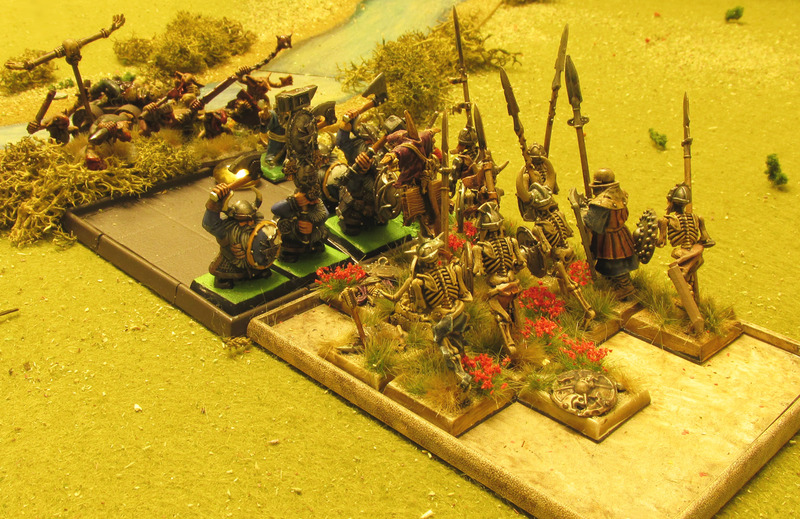 Alas they are overcome and not a single Dwarf is spared. 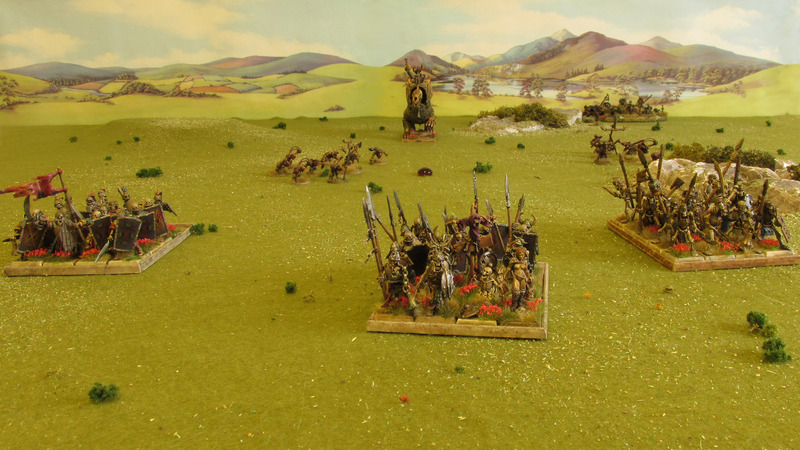 A very tense and interesting battle for both Graham and myself, my early success can be attributed to the capricious weather which cloaked my approach nicely and saved me from a hail of crossbow fire for the first couple of turns. 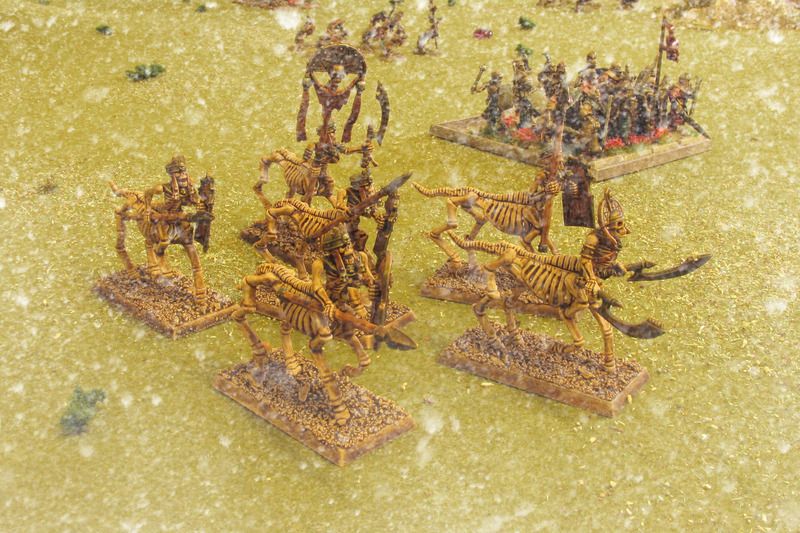 Indeed all seemed lost for Graham’s stunties, but he resolutely forged on and managed to deal me several terrible blows, not least the destruction of my Necromancer, the very linchpin of my whole army! 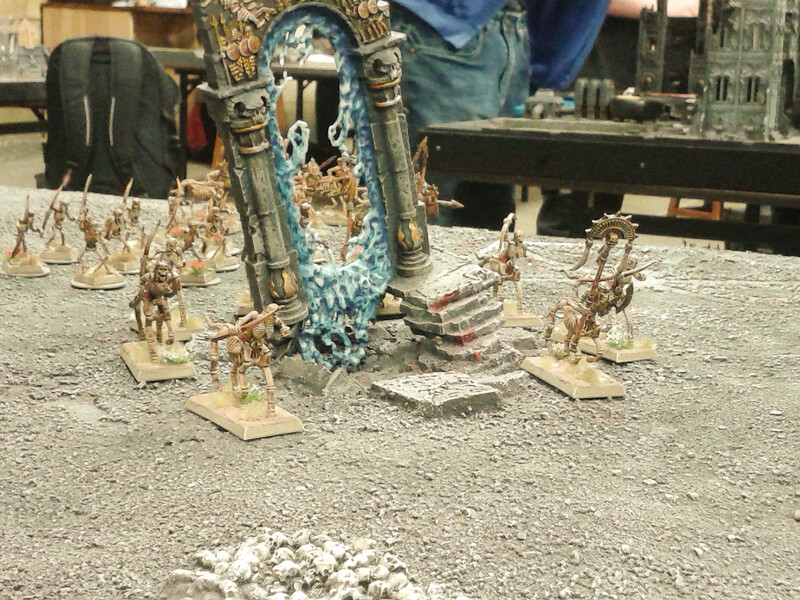 The day saw final victory to the legions of Undeath but at what cost? 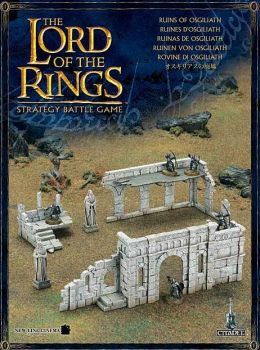 The next instalment will see the Dwarves attempting to close the Hellmouth Pass for good as a brave holding force hold the Undead long enough for Dwarven miners to collapse the cliffs to either side. I have been beavering away at the hobby bench these past couple of weeks adding new troops to my Grande Armée de la Mort. 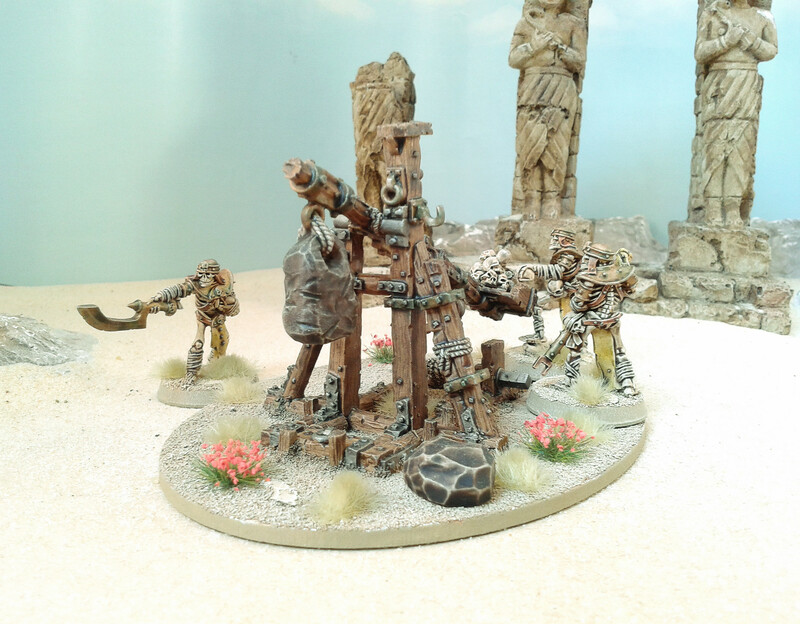 The first addition is this War Sphinx with howdah which will count as a heavy chariot in God of Battles. 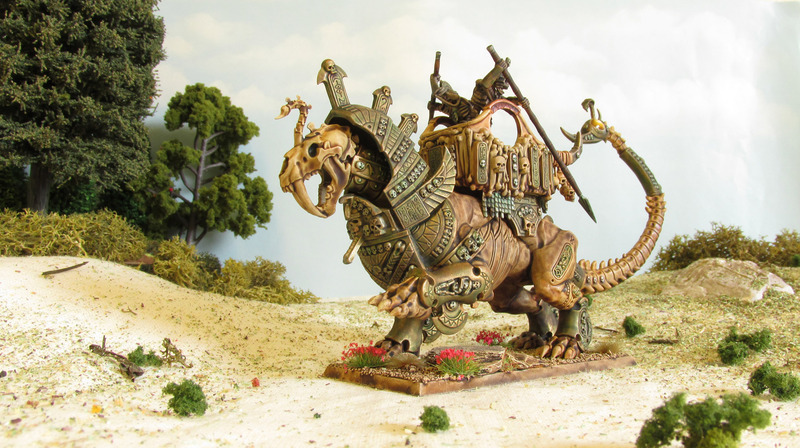 As well as this monster I have been doing some converting to create an undead cavalry unit with a difference but have still to finish them. 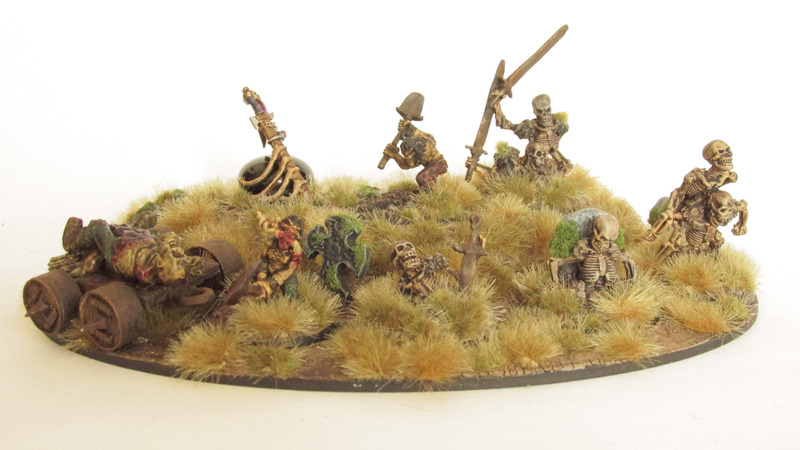 I will be getting together with Graham very soon to fight out the next battle of our fantasy campaign and I hope to get my new reinforcements ready to take to the field for my next foray against his infernal Dwarven clan. Women… always the last to get ready!? 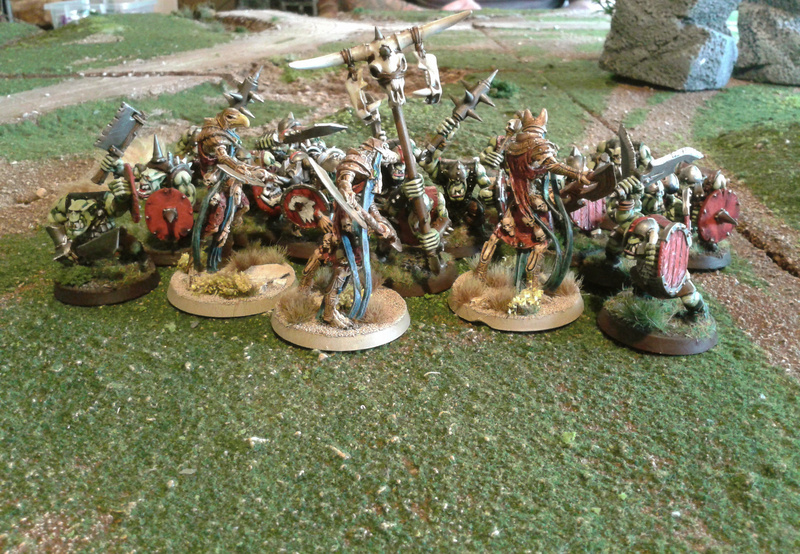 This concludes the first stage of the army (24 points) and very proud of it I am too! 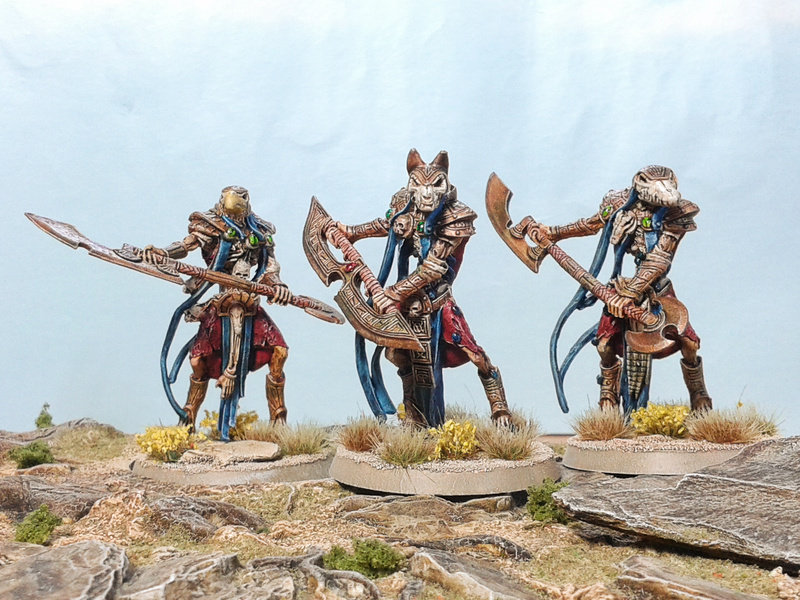 I look forward to seeing them hit the battlefield sometime soon, hopefully against Dwarves as I have sparked Graham’s interest in playing some Fantasy gaming. 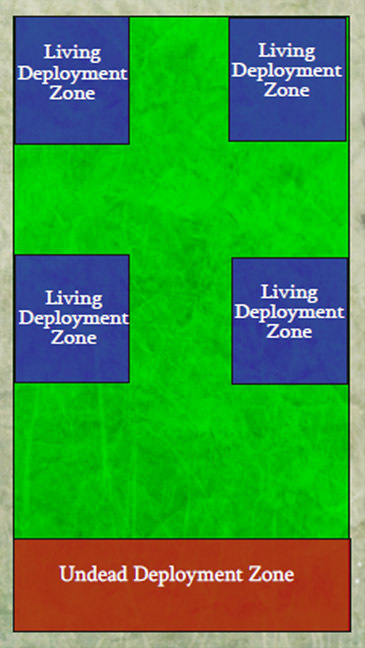 Eventually I will start trying out some combinations for the next stage of 36 points using proxy models. I hope to start on these over the next couple of days, but as I would like them to be easily transported I will need to have a good think about whether they could be built in a ‘knock-down’ format if at all possible, so that should keep me out of trouble for a while! 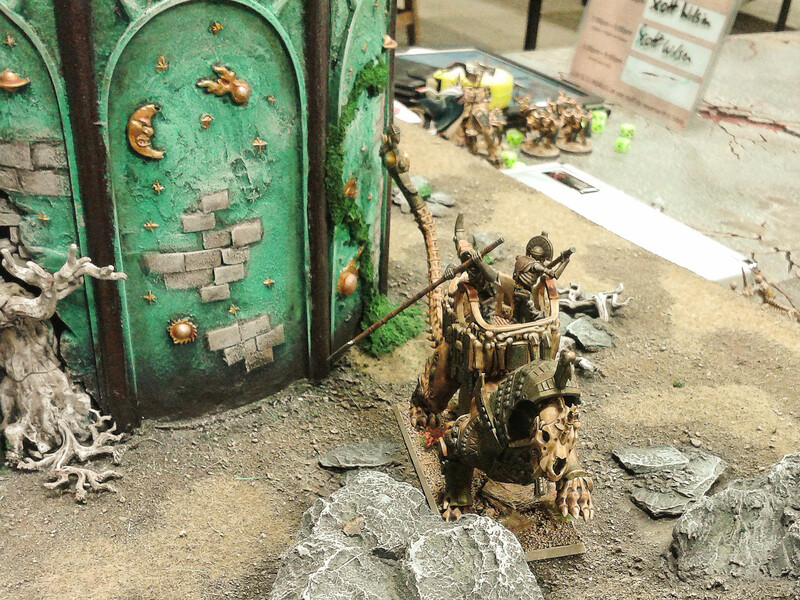 The figures on the baggage camp are removable and double as ‘Activation Counters’ whilst playing games of God of Battles. 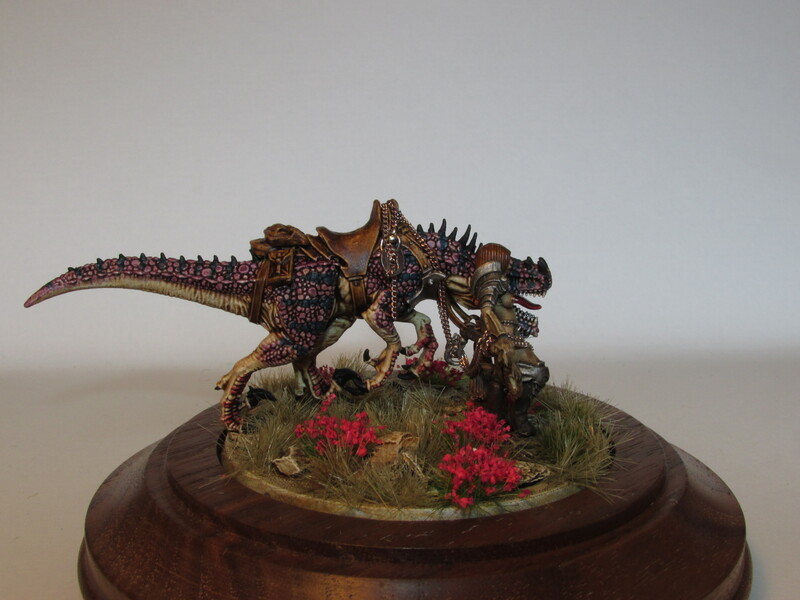 I have left spaces on the camp for some flowers which I will be picking up at ‘Salute 2014’ upon the ‘morrow, but all told I’m almost finished… Almost being the operative word because as well as needing to paint her malevolent highness I also have one more thing to do… My good friend Quirkworthy commented that the large shields of some of the skeletons would look good with some heraldry applied and brought to my attention Little Big Man Studios who make banners and shield transfers for a number of different eras and scales. 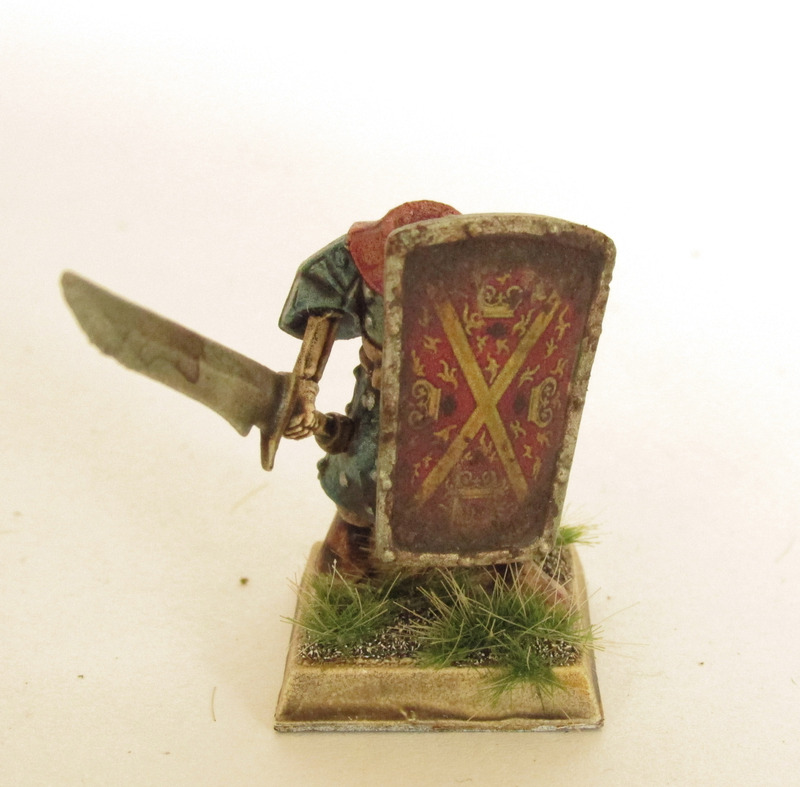 I found that the transfers for Perry Miniatures ‘Burgundian Pavises’ were a close match and ordered some sheets with alacrity. They arrived very recently and so I have done a test model… These transfers look fantastic and are very easy to apply (they are provided with an instruction leaflet which shows you how to go about it). 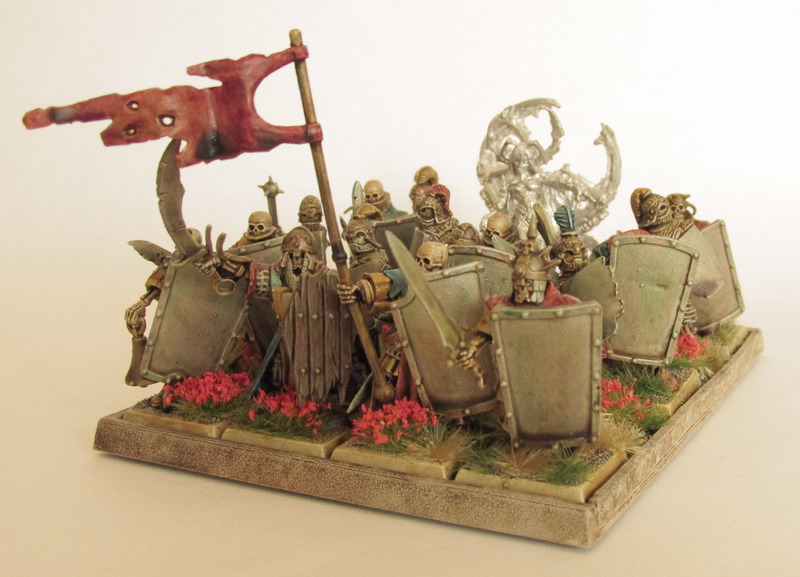 Now they obviously don’t match my GW shields perfectly, however, with a dabbing of GW’s new ‘Typhus Corrosion’ special effects paint I have blended it in nicely and I am most happy with the result! 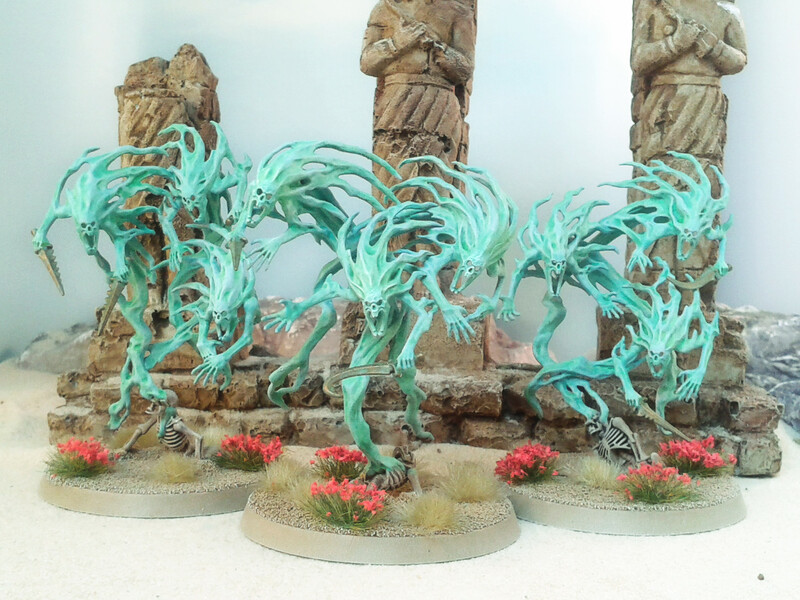 I will be giving the same treatment to the rest over the weekend and hope to get The Ghoul Queen prepared for a coat of paint next week. Once those little tasks are complete I will probably start looking towards the next stage of this project but more on that next time!.. 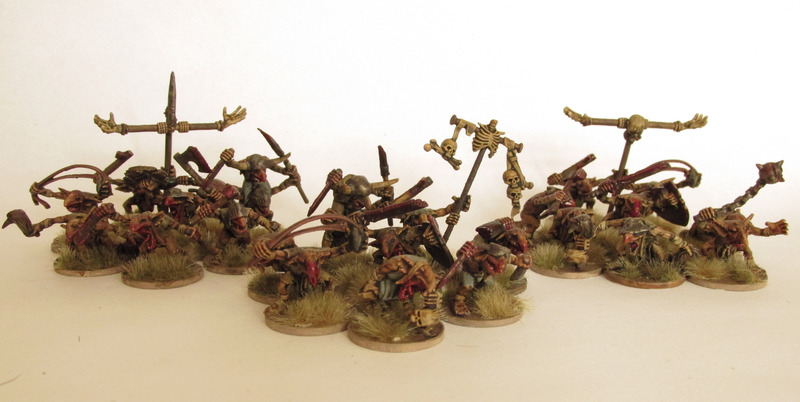 The horde of shambling horrors march ever onwards, always swelling their ranks with the bodies of their fallen foes! I want a pony for christmas! 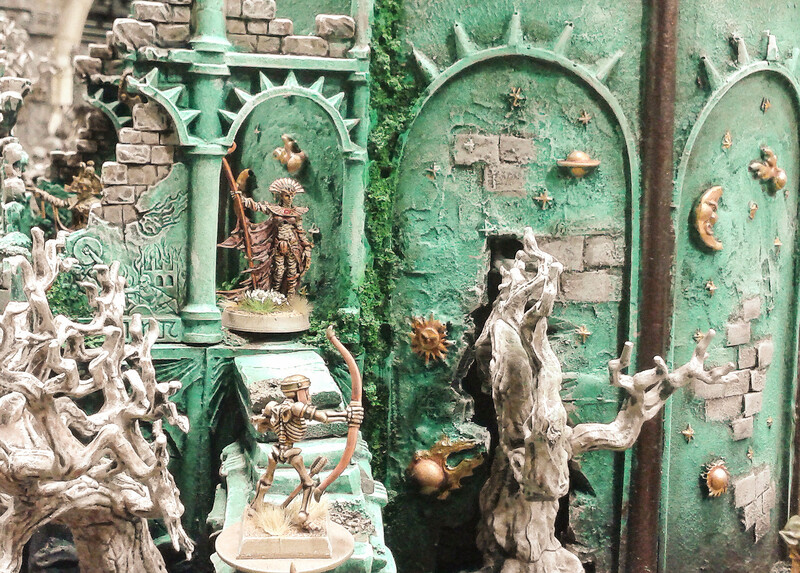 For some time now I have been harbouring an idea for a small diorama for my warrior princess Kalee. 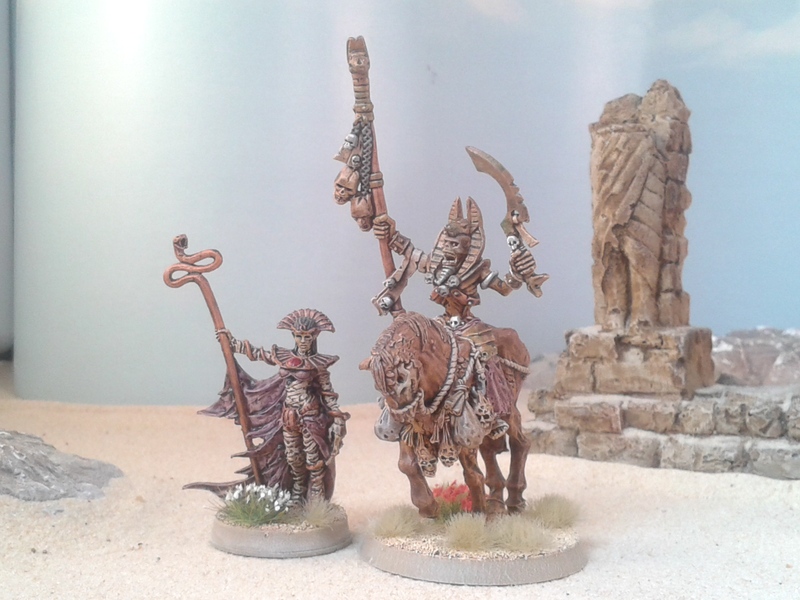 As part of my God of Battles undead army, she holds her rightful place at the head of her very own skeleton regiment, but I also wanted to be able to display her on her own.